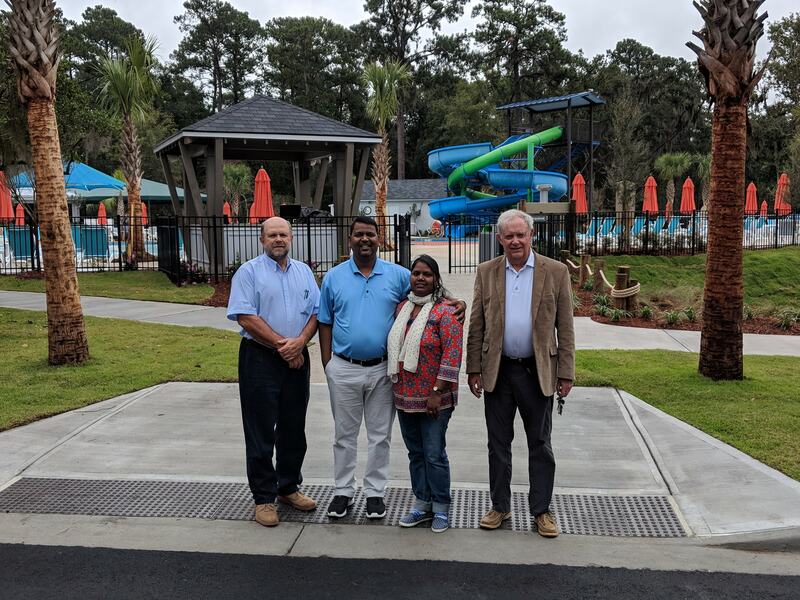 This past Wednesday at the mission dinner, many of you took advantage to hear M K tell the story of his conversion to the Christian faith and how he and his brother are now doing incredible work planting churches in North India. M K was a Hindu, from the class that used to be known as “the untouchables.” When his older brother became ill in 2000, they thought he was going to die. They’d taken him to the best doctors they could afford in Delhi, who sent him home instructing his mother to care for him in his final days. But then they met two Christian missionaries who began to pray. He became better and eventually was fully healed. The family embraced Christianity and the two brothers have a vision of planting tens of 1000s of home churches across North India. 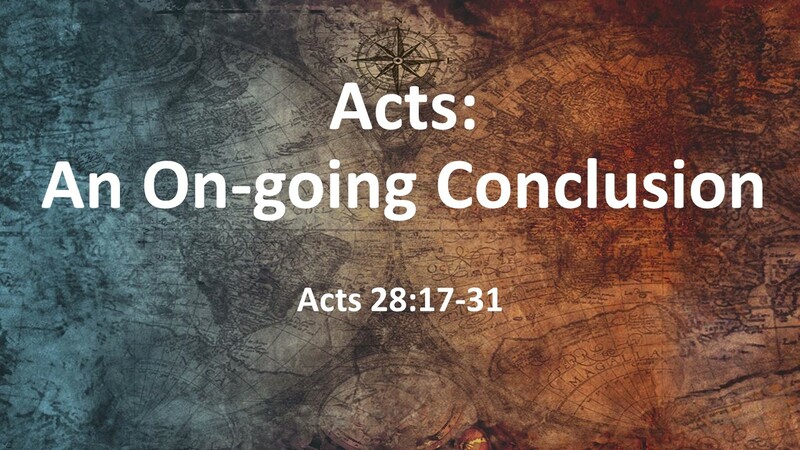 I tell you this snippet of his story, especially for those of you who didn’t have a chance to hear his testimony, because I want you see how the Book of Acts purposely doesn’t end. God’s Spirit continues to be active in our world, calling new people into a faith with Jesus Christ. I began preaching on Acts in the winter of 2015. We’re at the end. After this morning, during the three periods I’ve focused on Acts, I will have delivered 52 sermons from this book. Let me review a few things that I hope you have gleamed from this series. The challenges of the 1st Century aren’t that much different from the challenges of today as we, like them, are proclaiming a message to a mostly indifferent world. The church is never promised an easy existence. It’s God’s Spirit who motivates and directs the church. 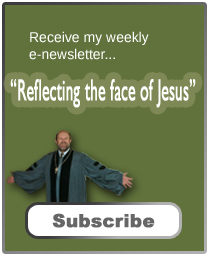 The gospel flourishes despite persecution and challenges. My desire by our going through this book is to demonstrate the hope we have in Jesus Christ. God has entrusted his church with the message and calls us to participate with the Holy Spirit in telling the good news and bringing the kingdom of God closer to a reality. The book of Acts comes to an end, but the work of the church empowered by the Spirit continues. Read Acts 28:17-31. 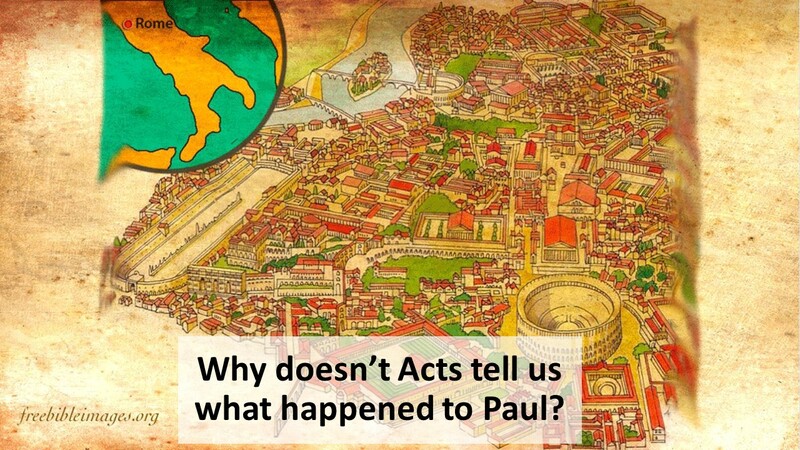 Acts ends with Paul living in Rome under house arrest. Why doesn’t Luke, the author, tell us what happened to Paul? After all, we know what happens, don’t we? Paul was martyred in Rome. It’s generally accepted that he was beheaded. It was the more preferable method of execution, generally reserved for citizens of the Empire. While still bad, at least it didn’t create the horrific suffering that came from the Roman’s other methods: crucifixion or burning in tar. Tradition has it that Paul’s execution came during the persecution of Christians following the burning of much of Rome in the year 64. It was thought by many that Nero had part of the city burned so he could rebuild it to his liking. Kind of like those wildfires out west, it got out of hand. The emperor didn’t appreciate the scuttlebutt. He felt people were pointing their fingers at him. As a way to deflect their criticism, Nero used Christians as a scapegoat. As politicians are apt to do when they come under scrutiny, Nero blamed the fire on “them.” In this case, the “them” were Christians. 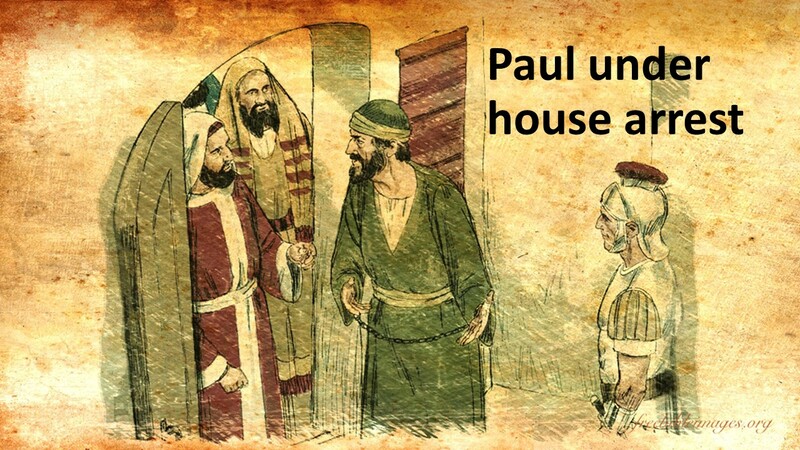 While we can’t be sure that Paul died under these circumstances, it seems plausible. Furthermore, the date and approximate timing fits other reports from the first century that speak of Paul’s death. All this is interesting, but why doesn’t Luke tell us what happened? Even if he finished this book before Paul’s death, by the time of the second edition came out, he could have easily added another chapter. What does Luke’s failure to speak of Paul’s death say to us? And what should we take from this passage to apply to our lives and to the church today? I’ll come back to these questions, but first let’s dig into the text. One of the first things Paul does when he gets to Rome, this he does on his third day there (after cleaning up and catching his breath) is to call the Jewish leaders together. We have seen this throughout Acts. If there are Jews in the city he’s visiting. It’s the first thing he always does. Paul reaches out to the leadership of the synagogue. Paul goes into this meeting somewhat on the defensive. “I’ve not done anything wrong,” he says. “I’ve not done anything against our people.” Either Paul feared that the Jews in Rome had heard about his problems in Jerusalem, or maybe since he’s still a prisoner he felt he needed to be defensive. 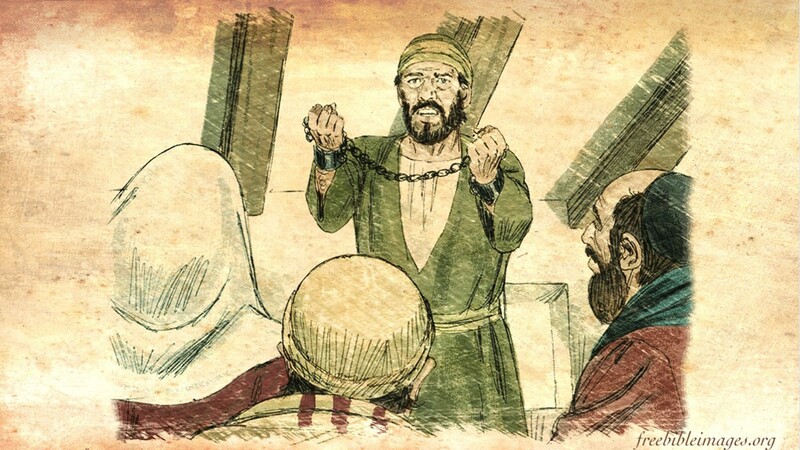 After all, he’s standing before them in shackles saying, “I’m innocent.” It appears the Jewish leadership in Rome are not familiar with Paul’s issues. Afterwards, Paul who is confined to his home, begins to preach as people visit. Furthermore, we’re told, Paul provides his own expenses. We don’t know what he did. He could have continued making tents or had gone into some other business, as he had plenty of time while awaiting trial. A few of those who came and listened became believers, but many just argued. In verses 26 and 27, Paul quotes from the Prophet Isaiah and interprets this to apply to his preaching. The Jews don’t listen, but the Gentiles do. Paul continues to boldly preach, without hindrance and while welcoming everyone, we’re told, for two years. And with that, the gospel firmly grounded within the gentile community and having been proclaimed in the greatest city of the world at that time, the Book of Acts comes to an end. Back to that question I asked earlier, “why does Luke end the story here and not with Paul’s death?” I think Luke did it purposely. The story concludes while on-going. 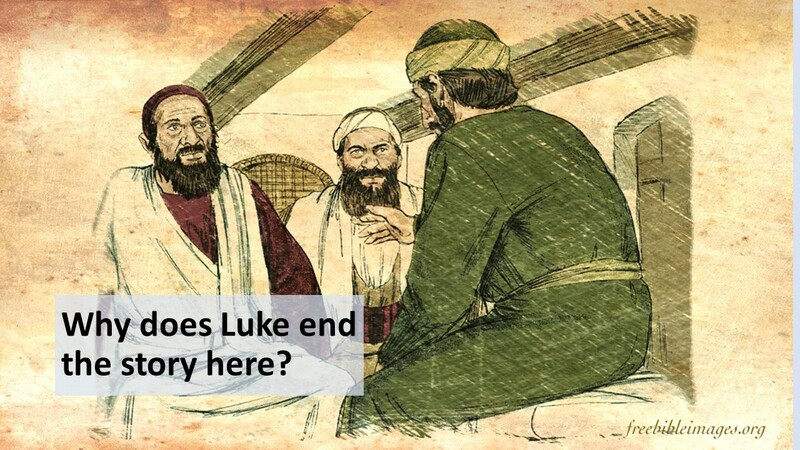 Luke knows the story won’t come to an end with the death of Paul or Peter or any of the other Apostles. After all, we’ve already survived the death of Stephen and James. But this isn’t really a story of the Apostles. 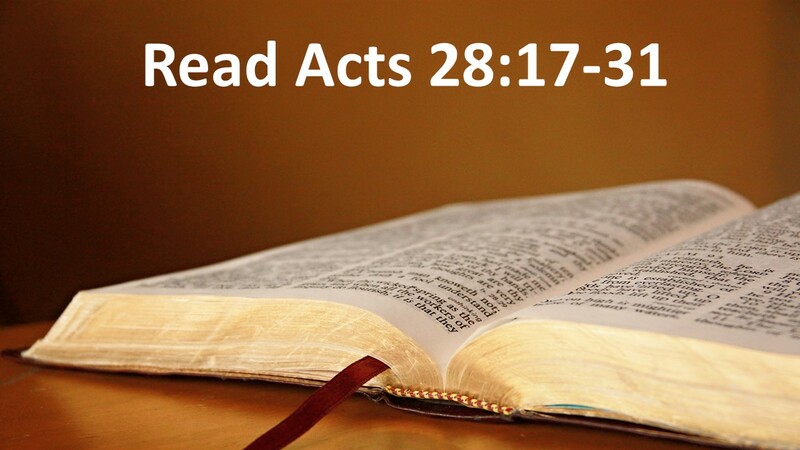 Acts takes up where the Gospel of Luke ends. This is the story of the resurrected Christ whose Spirit empowers the church to continue to proclaim his message to the world. And in this manner, we fit into the story when we participate in spreading the good news. Whenever we do something good for another because of our faith in Jesus, we add chapters to this book. M. K. and his brother are continuing this story in India as are countless others across the globe. Luke ends the story, calling others to join the effort. Today is the day we honor veterans, and it’s also the 100th anniversary of the armistice taking effect at the end of World War I. Let me draw a parallel here to those in who have led the church in the past and us in the present by considering military cemeteries. One of the things I appreciate about our National Cemeteries is that rank holds no privileges, at least not in death. The graves are all the same. 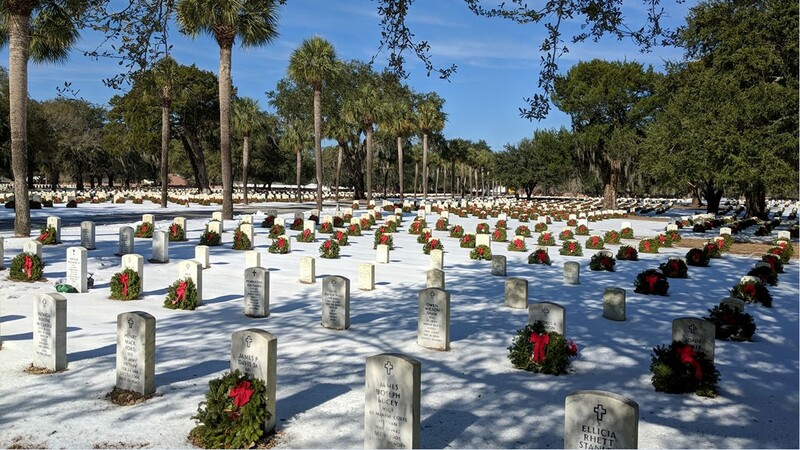 Generals and admirals are buried beside soldiers, marines, airmen and sailors. They are all marked with the same type of tombstone. We don’t honor just the top brass; but everyone who served. In the end, it’s not individual bravery that’s important but the experience of the freedom obtained by their collective sacrifices. Something similar is true in the church. What’s important isn’t individual actions, but what God’s Spirit has done and is doing through the church in the world. 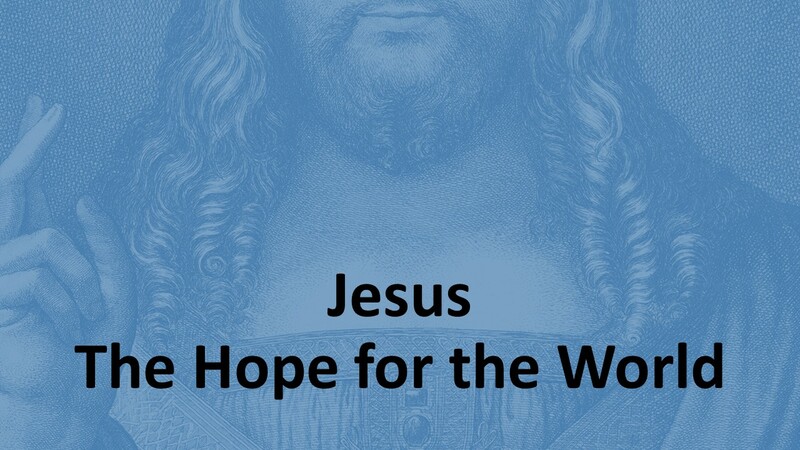 Luke ends his story, not by focusing on Paul and directing our attention to his death, not by singling him out as a hero, but by inviting us into the story as we continue to lift up Jesus Christ as the hope for the world. We’re all a part of this story and in the end the faithful will all be there in white robes before the throne. It doesn’t matter if we are a Paul, or one of those preparing to join the church this morning, or some unknown soul sitting on the back pew, we’re all called to do God’s work. That’s why, I believe, Luke ends the book in this manner. Instead of neatly ending with an exciting conclusion, Luke wants us to write our own endings. 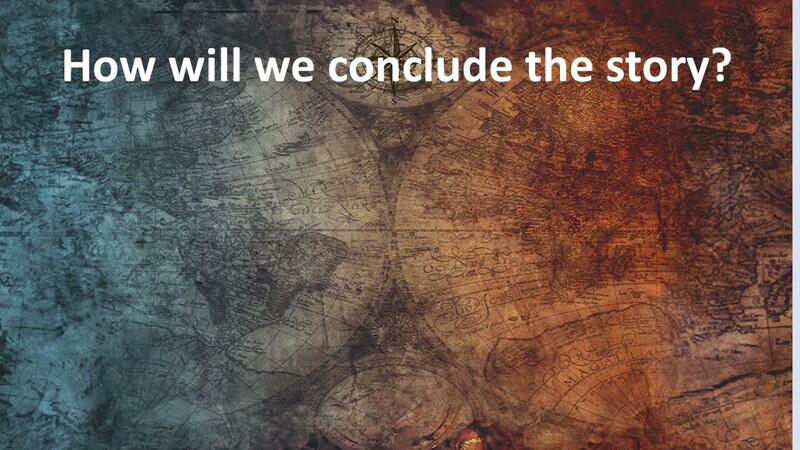 What are you going to do to continue the story? What are we going to do? Amen. See F. F. Bruce, “The Last Days of Paul: History and Tradition”, in Paul: Apostle of the Heart Set Free, (Grand Rapids, MI: Eerdmans, 1977), Chapter 37: The Last Days of Paul: History and Tradition, 441ff. See William H. Willimon, Acts (1988, Louisville: WJKP, 2010), 190-193. I noticed that too about the National cemeteries graves. They are all the same and I appreciate that because it doesn’t matter what rank you were just that they all served. 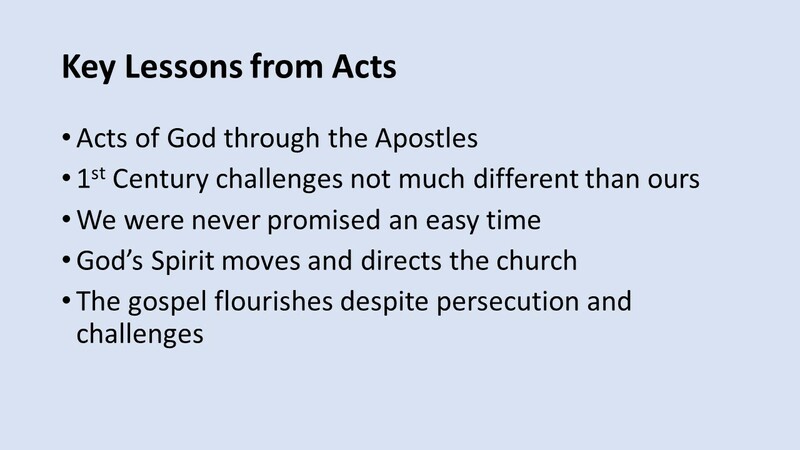 Enjoyed reading your thoughts on Acts. So sad that all the those apostles and disciples were murdered for preaching their message. As you said, they were scapegoats for the other problems going on at the time. But the message got out and still goes on long after their deaths. Seneca is the source closest to Nero, and indeed Caligula and Claudius for that matter that we have. Most everything else is written later or an extrapolation. And from Seneca we we have a glimpse of the true dangers to anyone living in or near the imperial household. Interesting. Though I’d still think Luke might mention his friend’d death, as a way to honor him and his work. Fascinating post. I appreciate what you say about military cemeteries and while it may be true for most, alas it is not the case at Arlington. There is definitely an aristocratic divide once you get to the top of the hill: senators, judges, generals, admirals and a President, of course. And yet, the most important stone on the grounds, indeed the most important of all military cemeteries, is at the Tomb of the Unknown. That’s a beautiful thing. I find it reassuring that Luke focuses on Christ as the hope of the world rather than on Paul’s death. To me it shows that the power of Christ is bigger than death, that the hope of Christ will always be with us. We do need a lot of love and hope for our world at this present time.